The ability to measure accurately and precisely is important for a number of aspects of scale modeling because, to one degree or another, modelers are usually attempting to reproduce a miniature representation of an actual subject. This means that you must be able to accurately scale down prototype measurements and then precisely transfer them to a model. Even if you are working from a kit, you may find yourself measuring the kit parts and comparing them with known dimensions so that you can verify their scale and accuracy. When dimensions or accurate drawings are not available, it may be necessary to derive measurements from photographs. 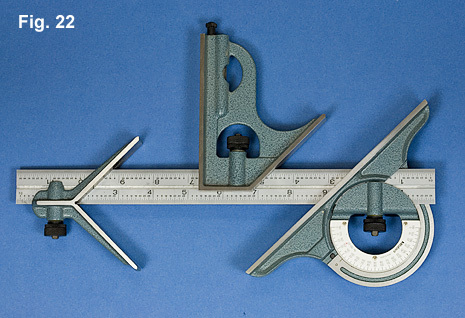 In addition to measuring distances, modelers also frequently need to use squares and protractors to measure angles. So whether it be planning or construction, the ability to measure accurately is essential. Rulers. The most basic of measuring tools are rulers. 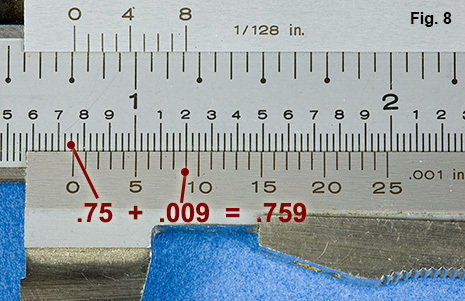 Measurements taken with rulers should be considered approximate and their accuracy is quite subject to the skill and interpretation of the operator. Errors in measurements taken with rulers arise because of the line thickness of the increments on the ruler and the distance of those increments from the surface of the object that is being measured. The most “precise” rulers have beveled edges with thinly engraved increments. Because rulers lack precision, it’s usually a good idea to limit their use to full size or large measurements where their error will be of minimum effect. For example: While using a ruler it is easily possible to generate an error of .025”. Now if this sort of error occurs in measuring up a 1/12th scale automobile, then the resulting error will be ± .3 scale inches. However, if you’re measuring up a 1/700 scale battleship, then that same error will result in an error of ± 17.5 scale inches. 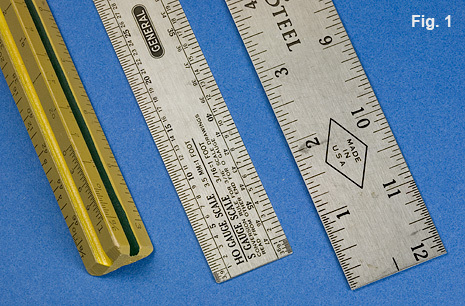 Rulers are generally most useful in drawing, laying out gross dimensions, or measuring objects that can be placed in direct contact with the ruler’s edge. Rulers are available in a variety of scales. Fig 1. A typical ruler will be laid out in basic inches or centimeters with various divisions in between. Rulers can also be found in some of the more popular modeling scales such a 1/48 or HO. 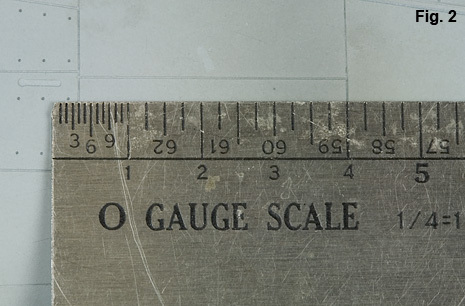 Rulers used by draftsmen are available in a number of different scales expressed as fractions of an inch and frequently found in the form of a three-sided ruler featuring scales from 1/8”=1’ to 3”=1’. Measuring with a ruler. The first rule of rulers is “don’t measure from the end.” Rulers are designed to measure from one mark to the next, not from the end to a mark. The end could be damaged or shortened and measurements would be even less accurate. Most good rulers begin their scales a small distance from the edge and many even have a special set of graduations leading up to the zero point. If you’re using a ruler with the edge being zero, measure from the 1” mark and then subtract one inch from the measurement. When using a ruler with a graduated scale to the left of the zero, align the right hand increment first so that what you are measuring extends to the left of the zero but stays within the graduated scale, Fig. 2. For the final measurement, add the values of both scales together. While I seldom measure a model with a ruler, I would never be without several good metal rules of different sizes simply for quickly checking drawings and because they make excellent straight edges to scribe and cut against. Spring calipers and dividers. The purpose of a spring caliper or divider is to transfer or compare dimensions. This is done most frequently when working with drawings so that distances can be compared to a scale published along with the drawing or transferred directly to the model, Fig. 3. Dividers can also be used to mark off regular increments or scribe circles. They are available in styles used by machinists or types with replaceable nibs that are used by draftsmen, Fig. 4. A simple cutting blade can easily be made by sharpening a piece of steel wire into the shape shown in figure 5. Spring calipers are also available as “inside” and “outside” types, Fig. 6. Inside calipers measure between opposing surfaces or inside of things and outside calipers measure outer surfaces of objects. Precision measuring calipers. Without a doubt, the most useful measuring tool for modeling is a precision measuring caliper, Fig. 7. A single caliper can allow you to measure outside, inside, and depth dimensions. Precision calipers are manufactured in a variety of sizes and styles as well as units of measurement. Chose a caliper that feels comfortable and operates smoothly. Keep in mind that a 6” scale is more than adequate for most modeling chores. One variation among calipers is how the jaw moves and locks. Some have a spring-loaded release that, when depressed, unlocks the slide. Most simply move freely unless a locking screw is tightened. Some calipers are constructed with a two piece slide that provides for additional precision in movement, Fig. 7. 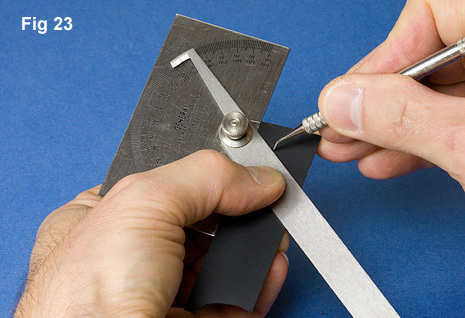 Typical units of measurement for calipers are fractional and decimal inches along with metric. Some calipers have also been manufactured in specialized scales such as “O” scale (1/48 scale), Fig. 7. In the US, the most common scale is decimal inches. Today, because of their ease in use, the digital and dial calipers have pretty much replaced the vernier type caliper. However, the vernier scale is used on both calipers and micrometers and I much prefer the handling of vernier micrometer over a bulky digital version. For this reason, along with the fact that verniers never need batteries, I think it is good form that a craftsmen should be able to read a vernier. Otherwise it’s like being the youngster who can only read a digital watch or someone who can’t drive a manual shift car. Reading a vernier caliper. The vernier is a set of marks on the movable slide. It’s that “funny” scale that never seems to line up with anything. In fact, the marks on the vernier do line up with something and their function is to accurately indicate the “in-between” distance when the zero reference mark (the first mark) on the slide does not fall exactly opposite a mark on the main scale. To read a vernier scale, the first step is to look at the zero mark of the vernier scale. Does it fall exactly opposite a mark on the main scale? If it does then you need go no further. Just read the measurement directly off the main scale. You can verify that the mark is perfectly lined up because none of the other marks (except the last mark) on the vernier line up better with a mark on the main scale. If the zero mark on the vernier falls between marks on the main scale, make a note of the value on the main scale that falls immediately to the left of it. This is your “base” value, to which you must add the “in-between” value. To determine the additional value, scan the vernier scale until you find a mark that lines up perfectly with a mark on the main scale. Then read the value off the vernier scale and add it to the base value. On a typical decimal inch scale, the graduations on the main scale will give values to the nearest .025” (twenty-five thousandths of an inch). For example, Fig. 8., the zero mark on the vernier scale falls just to the right of the second tick mark past the 7 so the base number is .700 (seven tenths of an inch) plus two increments of .025” (twenty-five thousandths of an inch) for a total of .750”. To determine how much further to the right of .750 the zero mark is, look along the vernier scale until you find a mark that lines up precisely with a mark on the main scale. Which mark on the main scale is irrelevant because the value will be read off the vernier. In the example, the number 9 on the vernier falls exactly opposite a mark on the main scale, so the value from the vernier is .009” (because each mark on the vernier equals .001” or “one thousandth of an inch”). Add .009” to the .750” and you have .759”. While it seems to be a lengthy process, after you have done it for awhile, it will become second nature. Dial calipers. Calipers with a dial indicator, Fig. 9. work much the same way as a vernier in that you add the number indicated on the dial to the number on the main scale or you can count the revolutions of the indicator. The advantage is that you don’t have to make the calculation. The downside is that they are the most delicate of the different caliper types. Digital calipers. The latest and greatest type of caliper is the digital caliper, Fig. 10. It is the type that I reach for the most. The digital display reads the entire measurement so it is extremely fast to read. You also have the advantage that you can quickly switch between inches and metric. A digital caliper can be zeroed at any point. This feature can either prove to be a convenience or a problem. In normal use, close the jaws and zero the caliper. Open and close the jaws and check that the value does indeed go back to zero, if it doesn’t, make sure there isn’t debris between the jaws and zero it again. You should be able to open and close the calipers and have it reliably return to zero. Now you can make your measurement. A digital caliper can really save you time when comparing the size of two objects. Simply place the caliper on the first object and press the zero button. Now transfer the caliper to the second object and the caliper will read the difference. The caliper will register negative or positive values so it isn’t important whether you measure the larger or smaller object first. This saves a lot of time in subtraction. Because they are so easy to use, I would recommend this type over the others. However, when selecting a digital caliper or micrometer, one consideration is battery life. The worst scenario is that you reach for your caliper and the battery is dead, you have no spare and the stores are closed. My favorite caliper has an on/off switch and the battery lasts for years. Most digital calipers and micrometers now have auto on/off switches and I find that the ones that I have with auto on/off just eat batteries. 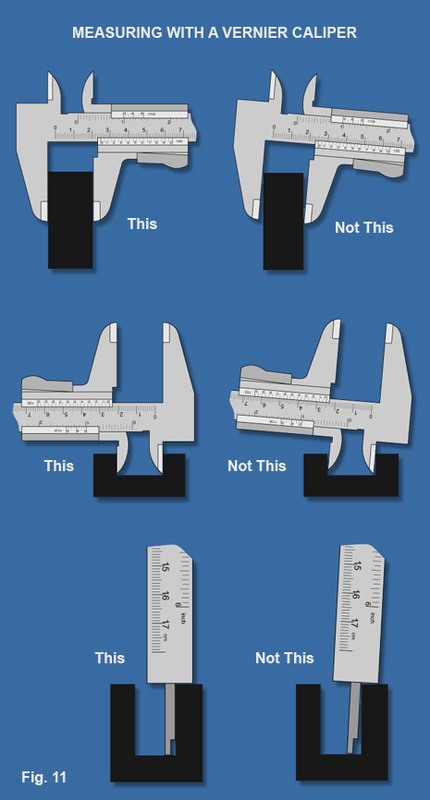 No matter which type of caliper that you choose, there are some common basic techniques of how to use them successfully. Fig. 11, shows how to make different types of measurements. While this figure stresses the need for proper positioning of the calipers, another important factor is the pressure applied to the jaws. You want to be careful so that you don’t distort or compress what you are attempting to measure. A good habit to get into is measuring everything at least twice. Fig. 12 shows a useful modification to a vernier caliper. The tips of the jaws have been sharpened. This helps in two ways. First, this allows the caliper to fit into tighter spaces and second it is sharp so you can easily scribe precise lines. Some calipers are manufactured this way and don’t need to be modified. One word of caution: If you perform this modification on a grinder, be careful to remove material only from the outside portions of the jaws and work slowly so you don’t overheat the tips. 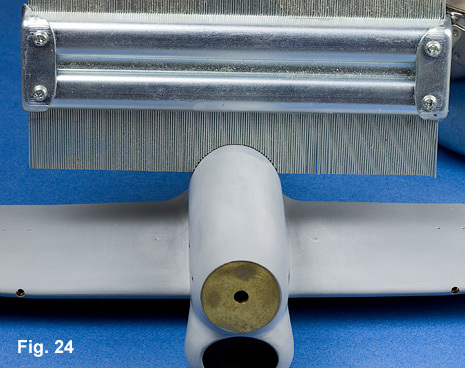 Take extra care to prevent abrasives from being incorporated between the slide and the rule. Micrometers. While calipers are infinitely more accurate than a ruler, the final word in accuracy is the micrometer. By providing a smoother and finer movement along with a more ridged frame, micrometers take the guesswork out of the “in-between” measurements. Like precision calipers, micrometers come in a number of styles, but unlike calipers, you need a separate micrometer to measure outside, inside, and depth dimensions. 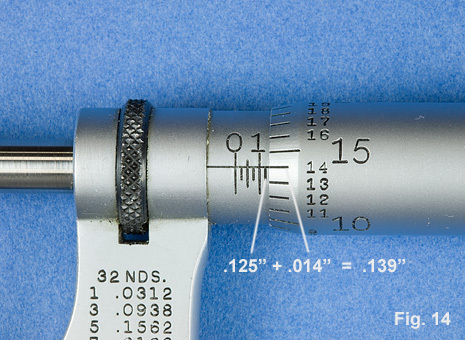 For modeling, a 1” outside micrometer is ideal, Fig. 13. Micrometers measure by using a finely threaded shaft that moves the spindle in and out when the barrel is rotated. Measurements are shown on scales engraved on the micrometer barrel and thimble. Although similar, learning to read a micrometer is easier than reading a vernier caliper. To read a micrometer you must take numbers from two different scales and add them together just as you did with the vernier caliper. The base number is taken from the scale on the barrel. On a typical micrometer that reads in thousandths (.001”) Fig. 14, each rotation of the thimble opens or closes the micrometer .025”. This is registered on the barrel, where each mark represents .025”. After noting the base number, look at the scale that is engraved around the thimble. Each mark represents .001” (one thousandth of an inch). You read the number on the barrel that lines up with the horizontal reference line on the base scale and add it to the base number. In the example, Fig. 14, your read .125” on the base scale and .014” on the thimble scale. The total is measurement is .139”. 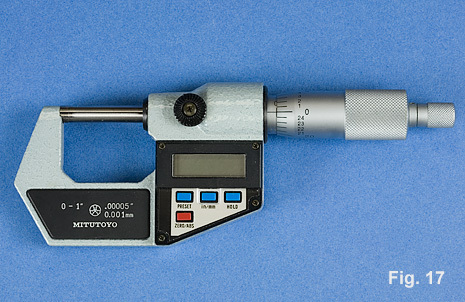 Some micrometers have an additional vernier on the barrel that will allow you to accurately measure to .0001”, Fig.15. Like calipers, there are other types of micrometers that display their readings in a more direct way. 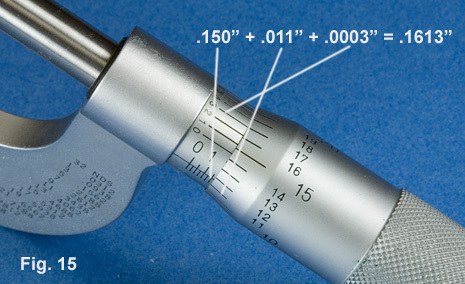 Figure 16 shows a micrometer that uses a mechanical counter to register the measurement. This type helps minimize errors that may arise from inexperience, but for precision you need to verify the accuracy by reading the measurement from the conventional thimble and sleeve that is also provided with this type. Again, like calipers, micrometers are also available in digital format, Fig. 17. This type operates much the same way as the digital calipers. And again, if possible, select one that has a manual on and off switch rather than an automatic "power-off feature". While these types of micrometers are easy to read and very accurate, I have found them to be bulky, heavy, and generally cumbersome to handle. Even more so than calipers, using a micrometer requires a certain "feel". It is extremely important to develop a sense of how much pressure to apply. 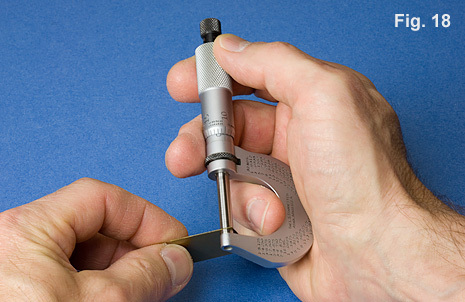 Some Micrometers come equipped with a ratcheted thimble which can help keep pressure consistent. My experience has been that the comfort and handling of a standard one inch "mike" counts for more than the digital display. If you only own one micrometer, my personal recommendation would be to have a top quality one inch outside micrometer that reads in thousandths. Scale dimensions. Most measuring devices, as well as stock building materials (tubing, sheet stock, etc. ), utilize actual full size dimensions. As a scale modeler, you are constantly converting between these "real world numbers" and scale dimensions. Making these conversions becomes easier when there is a thorough understanding of how scale relates to prototype. What does it mean when a model is constructed in 1/48th scale? When a model is built in 1/48th scale it means that the model is 1/48th the size of the real subject, or that the real subject is 48 times larger than the model. In this example every 1/48th scale inch equals .021" in real measurements. You can easily check this by simply dividing 1" by 48. In the reverse, every one "real" inch is equal to 48 scale inches. These same principles apply to any scale. When converting between real and scale dimensions, you will find it makes the most sense to work in units of inches or decimal fractions of inches. As an example, you have a prototype dimension of 42' 8 3/4" and you want to know how long this is in 1/87th (HO) scale. The first step is to convert 42' 8 3/4" into decimal inches: 42' X 12 = 504", then add 504" + 8" = 602" ; next you need to convert 3/4" to a decimal by dividing 3 by 4 = .75" which you add to the 602" for a total of 602.75". Finally you divide 602.75 by 87 and get 6.928". Whether you are transforming prototype dimensions to scale dimensions or back again, the first step is to convert all your dimensions to decimal equivalents. Sometimes scale is expressed as a certain unit equaling one foot and this can lead to confusion. Let's take the example of 1/48 scale. In this scale 1/4" is equal to one scale foot and you can often hear old craftsmen quickly referring to 1/48 scale as "quarter inch to the foot". On the other hand, RC modelers routinely use the term "quarter scale". To the uninitiated, these two expressions, "quarter inch to the foot" and "quarter scale", might seem to be referring to the same scale. However, nothing could be further from the truth. The term "quarter scale" actually does mean 1/4" is equal to one scale inch or that the model is 1/4 the size of the prototype.. "Quarter scale" is more properly termed "one forth scale". For ease in calculating individual measurements, it usually makes more sense to convert scales that are indicated as a fraction of an inch equaling one foot to a straight fractional scale. For example: 3/16" = 1' would be easier to use if expressed as 1/64 scale. To reach this answer multiply 12 x 16 = 192 (this is the conversion to inches), then divide 192 by 3 which equals 64. Squares. As well as distances, scale modelers need to know angles. An essential on any modelers workbench is a square. Squares are manufactured in different styles of fixed and adjustable types, Fig. 19. Because modelers work on small objects or in small spaces, you are not always able to use even the smallest of manufactured squares. I have also found it helpful to have a few homemade "squares" handy. These are also pictured in Fig. 19. These can be as simple as a small piece of acrylic or brass sheet with edges at 90 degrees. Squares are used to check angles of 90 degrees and in the case of adjustable squares, 45 degrees as well. While adjustable squares can be more versatile, good quality fixed squares are generally more accurate. Obviously, squares have to be precise, if a square isn't square then it's useless. To check a square for accuracy, place the square against a straight edge and draw a line; then turn the square over and draw another line right next to the first line, Fig. 20. If the lines are parallel, then the square is square; if the lines are not parallel, then get rid of it, repair it, or mark it as bad. I think it's a good idea to have several different sizes of fixed squares along with a good adjustable type. Although a square appears to be a very basic tool, you still need to know the proper technique for it's use, Fig. 21. The first step in checking squarness is to make sure that the object you are checking is firmly against the beam (bottom of the square). Slide the square so that the blade (vertical portion of square) just contacts the edge of the object. Now carefully check the space between the blade and the object. Is there a gap at the top or bottom? Is there no gap at all? When you use this method with the base of he object firmly against the beam of the square, you only need to look at the contact between the blade and the object. In the example of what not to do, the object is forced into the corner of the square which is not stable and could result in a gap against the beam, the blade, or both. This also happens if you push the object against the blade with too much force. Finally, always repeat your squarness checks several times; it never hurts to be sure. Protractors. Protractors are adjustable devices used to indicate any degree of angle. Protractors are also available in several styles that are useful to modelers. 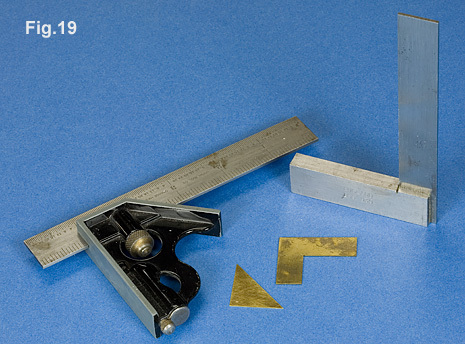 Because protractors are subject to the same type of errors found with rulers, they should not be used in place of a square when checking for 90 degrees. However, you can get a pretty good idea of how accurate your protractor is if you check it for accuracy at the 90 degree setting. Simply loosen the protractor and hold it against a fixed square. If the indicated angle is not 90 degrees, you have a problem. Some protractors have a scale that can be adjusted so as to fine tune their readings. With other types, it may be necessary to modify the indicator mark on the movable arm. Figure 22 shows a combination square, protractor, and center square. Figure 23 demonstrates the use of an adjustable protractor for scribing a line at a specific angle. Protractors can be very cumbersome to use around a model. 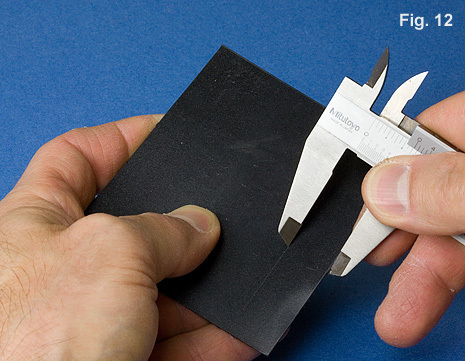 It is frequently easier to use the protractor to mark a piece of cardstock that can then be cut to the needed angle and will better fit the application. Another measuring device is a contour gauge, Fig. 24. This device uses a tightly packed row of steel pins to register contours. The registration of contours can be a bit course because of the size of the pins. Care should be taken to prevent the pins from getting bent and out of alignment. With the exception of rulers, measuring tools are precision instruments. Exercise care in their handling, use, and storage. Don't leave them buried under all manner of "work-bench paraphernalia" where they can come in contact with glues, soldering flux, or worse. Take precautions to keep them away from abrasive particles such as sandpaper or a grinding stone debris. With care, good measuring instruments are a lifetime investment and a must for scale modeling.